Has Cosmos found his place in the multi-verse?! Why is Thulu holding secret meetings with agents of Voltrax 4?! Can Wyan reconcile her feelings for Cosmos and her duty to her king?! Annnnd� just what would happen if Cosmos tried to absorb a supernova?! 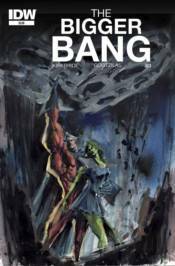 Find out in the penultimate issue of THE BIGGER BANG!